In a country where jobs are increasingly becoming hard to find and harder to keep, what helps you find satisfaction in your work? Work may not always be fun or exciting but you should be able to make progressive strides in your career through you what you do. It’s not uncommon to hear professionals say that they work in a job they are completely not passionate about or that they strongly feel they took the wrong career path. An Accounting professional who has the right accounting skills and is very passionate about his profession finds him/herself working in Admin. The only duty they handle remotely related to Accounting is petty cash management. Otherwise he/she dreads their job because that is not where their passion lies or where their skills are applied. In such a case, this person is in the right career but in the wrong job. An Accountant who is passionate about Admin work and performs very well in his duties. He has studied a profession completely different from what he is doing but he loves admin roles. He is in the wrong career but in the right job. This has become a common phenomenon in Kenya today highly being attributed to the scarcity of jobs. Hence, an increasing number of professionals are taking up jobs where they can be able to utilize their skills with a good number shifting focus to entrepreneurship. But even with the above two scenarios, most Kenyan professionals still can’t tell whether they are in the wrong job or wrong career. And this is what we are going to look at in this article. The industry you work in doesn’t always determine your job or career satisfaction. What matters is how many of your skills are you actually to use and continually improve on? In the Kenyan job market today, thousands of professionals have degrees they have never used. They spent at least 3-4 years in school only to find themselves working in a profession where they cannot use any of the skills they learnt. More often than not, blame is often shifted to the particular industry one works in. For instance you’ll hear someone say that their career would advance if only they were working in one of the big four audit firms in Kenya, or a telecommunications firm like Safaricom or even a Fast Moving Consumer Goods industry. But the truth is, it’s how well you can gain and apply skills and not so much the industry. Whether a large or medium sized industry, you determine the level to which your career grows. You are the one who decides whether you will confine yourself to the job description or go out of your way to learn. Before you rush to leave your current industry because you feel you are not progressing career wise, examine the current trends. There are industries whose growth is projected to increase in the next few years. Ultimately, this will bring new opportunities for carer advancements, promotions, projects and work responsibilities. Import of second hand cars among others. So whereas you might need to change jobs, don’t change the industry. Rather focus on the companies that are doing very well and have potential of growth within the same industries. For instance, the cab driving business in Kenya is gradually gaining momentum. Many have actually quit their day jobs to become full time uber, taxify, Mondo etc drivers. Another industry that has the potential to do very well is App Development. As long as you have the means, funds and right market and digital knowledge, you can have one single app provide you with a steady source of income. A number of Kenyans have taken this up and even though it’s a journey that requires patience and consistency, the future holds a lot of promises. Your job should stretch you and make you uncomfortable in order for you to grow. So what you DO NOT need is a “perfect job” because it does not exist. Rather aim to have one that maximizes on your full potential. As a career coach I get to interact with a number of professionals who tell me how unhappy they are in their careers. When I ask them what it would take for them to gain that happiness they often tell me things like a good salary and working in a good company for a good boss etc. But this isn’t always the case especially in the demanding industries in Kenya today. 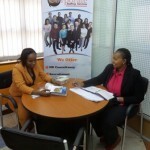 A survey conducted in 2018 sought to find out the level of employee satisfaction among Kenyans. From entry level to experienced professionals, the survey concluded that job satisfaction among male and female respondents was low. Female job satisfaction was even lower citing that majority of the respondents were at entry level positions whereas their male counterparts enjoyed senior positions that came with benefits and job security. So in this case, happiness is more aligned towards positions and benefits and not necessarily career growth. But getting a senior position is not a guarantee to happiness because even that has its own share of challenges and frustrations. Even an entry level position is a good footing for your career to grow more so because we always start from the bottom and work our way up. Whether you have a job or a career, what matters is,”am I using my skills to the best of my ability?”. If you can answer that question, then you are well on your way to gaining full career satisfaction.